I serve these burgers with cut up carrots and celery and a side of ranch dressing for dipping. In a large bowl, combine the turkey, salt and pepper, garlic, green onions, and celery. Mix to combine, and form into 4 patties. Heat a nonstick skillet over medium high heat and cook the burgers for 5-6 minutes on each side. Remove to a plate and cover with foil. Wipe the pan clean and reduce the heat to low. Melt the butter in the pan. Add the hot sauce to the melted butter. Return the patties to the skillet and turn to coat in the hot sauce-butter mixture. Place the burgers on bun bottoms. Top with ranch dressing and serve with lettuce on the buns. 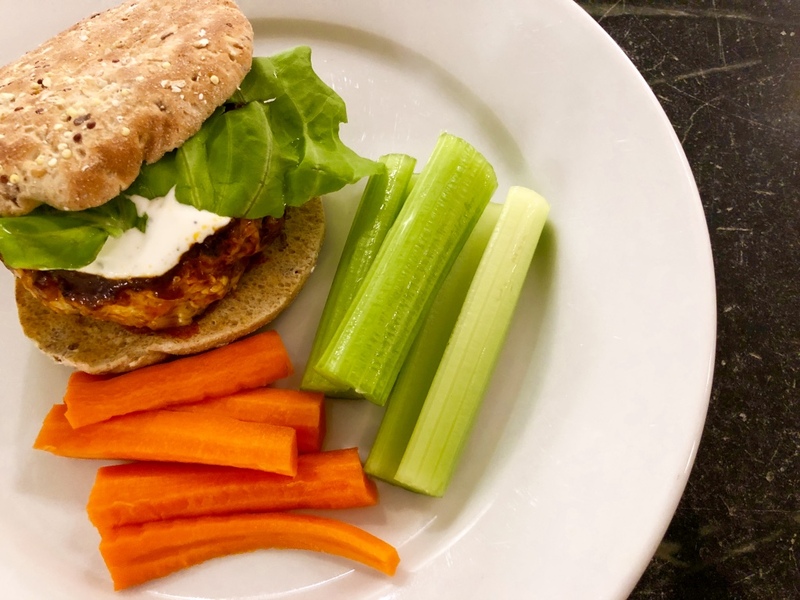 Copyright © 2018 Our Everyday Dinners - This is an easy recipe for how to make Buffalo Turkey Burgers.